Young Wittians of Grade 1 and 2 energetically and enthusiastically participated in the closing ceremony of Skating Camp. After a training of two months by trained coaches, they presented a spectacular show before the teachers and parents. 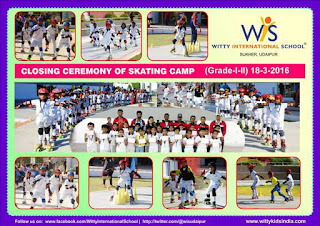 Wittians mesmerised the parents with their outstandign stunts while skating. Parents were also thrilled to see the advancement the kids showcased in a training of just two months. Last but by no means least, Principal Mrs. Shubha Govil awarded the students with the certificate of participation and extended her vote of thanks towards the audience. Eventually, it was a great success and the end of the session 2015-2016 will be remembered by the Wittians forever!